Ugh. I knew this to be a job I had to tackle sooner or later, and I wanted to be able to do it on my own terms. I'll apologize in advance for not having any or many photographs. Donna was away during the afternoon and I was really pressuring myself to get this done. I was up on the porch anyway, putting in another row of screws on two sides, and with that complete, didn't have many excuses not to try to finish off my ladder to the chimney. With my friend J! 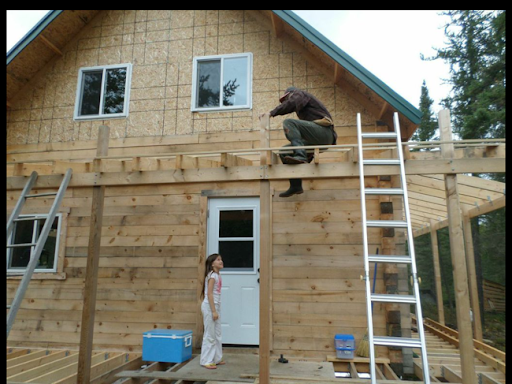 watching (to fill out the accident report I imagined), I stepped onto the bottom rung of my ladder timidly, and with it holding, I began screwing in more rungs. Repeating this process, also while holding onto a rather thin rope I had thrown right over to the far side of the cabin and tied off, as a last-ditch safety device, I worked my way to the peak. At the peak, with legs shaking noticeably, I put on the last two rungs (one on the far side of the roof to give extra stability to the whole contraption). I then went back up with my brush and rods to actually attempt the chimney clean. I managed to straddle the peak of the roof, and got the 7" brush down 10' until it became immoveably lodged in the stovepipe. Cursing under my breath, I finally returned to earth and wandered over to Grandpa's for advice. He suggested gripping the rod with vice grip pliers and trying to twist and lift it. I did managed to free it using this technique, but was unwilling to repeat the situation. Grandpa assured me that it would be sufficient to switch to a 6" brush and simply run it up and down the sides of the chimney briskly. I did this instead, but took the time to tie a rope to the brush, just in case it slipped from my hands and fell to the bottom of the stovepipe. I wasn't that interested in dismantling the stovepipe for a lost brush. This worked well, and I could feel the brush travel down, down until it hit the bottom of the chimney where my pipe narrows into the oval opening on the back of the stove. I brushed again as I raised it up and then returned to earth with a sense of accomplishment. Heading indoors, I removed the cleanout on the front of the stove and crouched down with a flashlight. I could see a mound of black ashes pouring out of the base of the chimneybox. Grandpa held up a small box under the cleanout hole, and I used the cleanout tool to drag the ashes into the box. We nearly filled it (it was about the size of a box of 12 pop cans or 6 bottles). Towards the end, the ashes became grey, which we both interpreted as being the ashes that normally collect around the firebox. Next up will be cleaning out the sauna stove, which I think may be more involved as I ponder the design of that stove itself. Of course, the most important part of any job is the cleanup. With L! 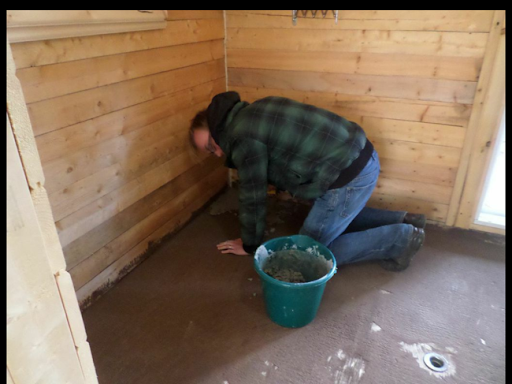 helping to parge the sauna floor, I was freed up to begin work on strapping the roof of the cabin porch. 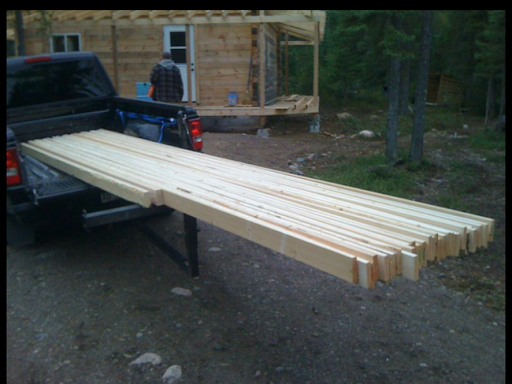 I had already purchased the straps and had them on the truck, ready for unloading. In short order I manage to installed one or two straps and by that time, I was prepared to call it a day. 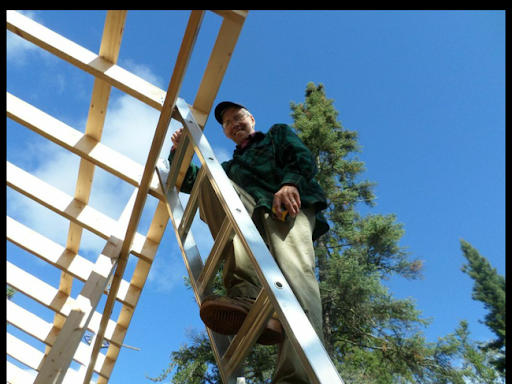 The next morning I headed back up and began plugging away when who should appear but Grandpa, offering his assistance! I gladly accepted and together we were able to make rapid progress. I spaced out four rows of straps on my six foot rafters. 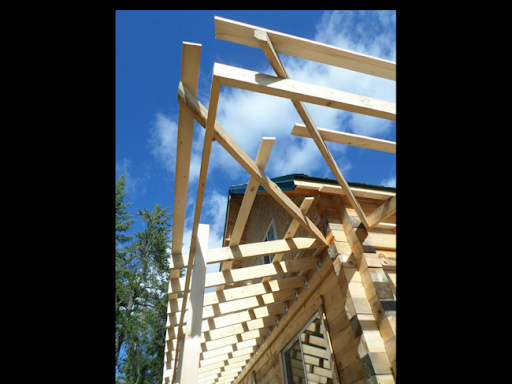 One strap butted up against the cabin, one flush with the ends of the rafters, and the other two spaced at about two foot increments. In the corners I was satisfied with the straps having a slight gap. The steel would probably not meet up completely in the corners either, but I had a hip flashing to cover any gaps that may appear. 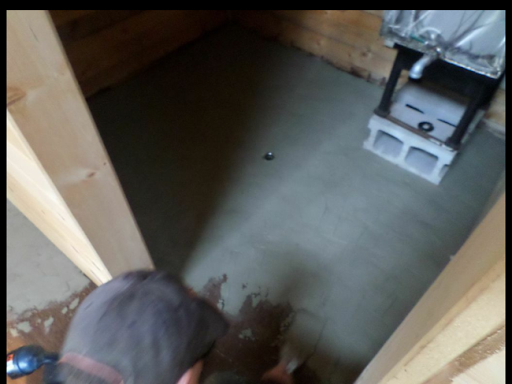 Grandpa very generously suggested we could use their sauna while we waited for the parging to finish drying in mine. I appreciated it very much, especially knowing that it meant Mummu felt obliged to give it a good cleaning before we trooped in to scrub up. I have three small 16" pieces to place yet, and then we are ready for the steel. The sauna floor has progressively gotten more and more disappointing. Finally with J! there, and the weather growing colder, I decided to address it directly. There were two main issues to my mind. The first was that in the washing up room, water tended to flow past my floor drain and pool at the opposite end of the room instead. As distasteful as the notion was, the only proper solution that I could see was to bend to the will of gravity, rather than fight it. As such, I purchased the fittings to install a third drain in the sauna (one in the steam room, and two in the washing up room). Cursing inwardly and warning my friend J! that I would be crabby for the duration, I slipped on my musty overalls and squirmed under the sauna to investigate my situation. In short order I managed to cut in a hole to access the floor where I wanted the drain, and installed it with surprisingly little fuss. 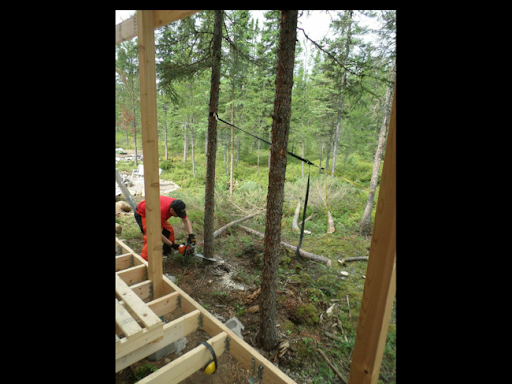 It was a bit of a challenge to cut and glue and set up the ABS pipe underneath the sauna, but I had experience with this from all my adventures during last winter. A new drain was installed in about an hour - not bad! This led me to the second sauna problem I had to address - the floor itself. 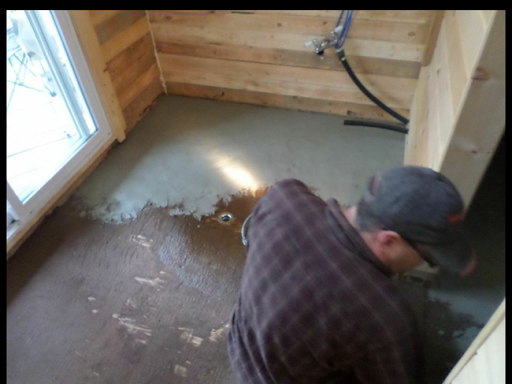 Initially I had thought of treating the sauna floor with a product known as "Stone Effects". This is a sort of roll-on stone coating that looked to fit the bill perfectly. While in the paint aisle, I happened upon another product called ReStore - a really thick, textured paint designed to go over wood and concrete, sealing it from the elements. It was able to be applied in one or two coats and at a far better price point than the three step "Stone Effects" system. At first it looked great, but after a short while, it began to flake off, especially in areas where the water was meant to flow. Very annoying! As time went on, it progressively became more and more gritty, until it was nearly impossible to clean, or walk on without feeling like you were just walking in dirt or (charitably) sand. I took to wearing sandles at all times. J! and his family graciously scraped off as much of this product as they could one day while I was away at work, but there were sections that stubbornly DID stay attached to the floor. Donna and I then decided to apply Thompson's Water Seal to the entire surface, and then perhaps hide it away under some rubber or plastic mats. While installing the new drain though, I realized that the old drains were now slightly raised above the surface of the floor (they were flush with the ReStore flooring, which had flaked away around the drains, leaving them noticeably higher than the surrounding floor). With much struggle, I realized that removing and reinstalling them flush was going to be a large undertaking. 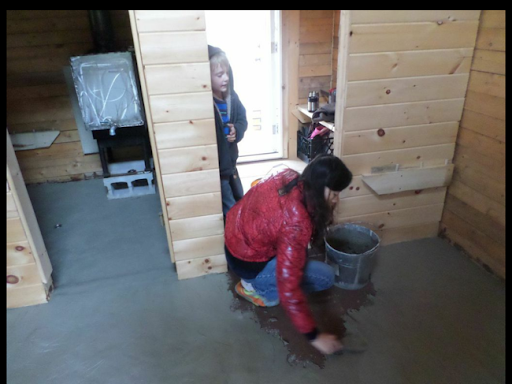 Instead, I finally decided to copy Grandpa's sauna - where he had mixed up a layer of concrete which he spread over all the wet areas of his building. I headed off to town again (!) and returned the water seal product unopened, and left with six bags of parging mix. 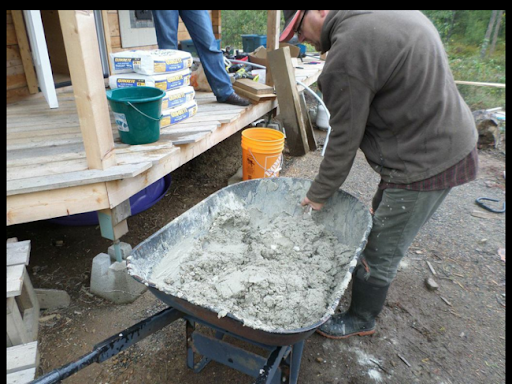 There was still plenty of day left, so I mixed them up in the wheelbarrow and J! and I set to work. He tackled the corner of the washing up room, while I headed straight into the steam room. It was a good job - I tried not to be too fussed on making it appear totally flat, just as long as it was smooth and sloped generally towards the drain. J! 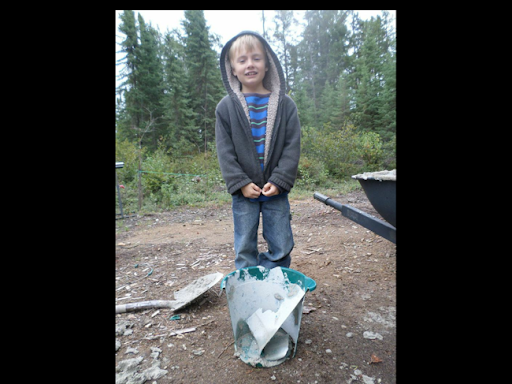 decided to take on a big portion of things, bigger than his bucket could handle. This led to the incident. After a short while, J! 's wife, L! came out to ask if she could try. Eventually all the kids took a turn, and then L! finished off the job by parging herself into the door frame. It has been drying out for two days now, and hasn't cracked during the drying process. I will keep my fingers crossed that the floor is stable enough to keep it in one piece. If not, I will likely have to patch it as needed, or perhaps silicone over any defects. I also plan on looking into sealing the entire surface. I can't express enough thanks to J! and L! for their help on this! It has been a real blessing to have them here this summer - they will be sorely missed when they leave for warmer climes. Well, it has been a slow progressing summer here for me, and so I'll just offer a quick apology for the length of time between posts. 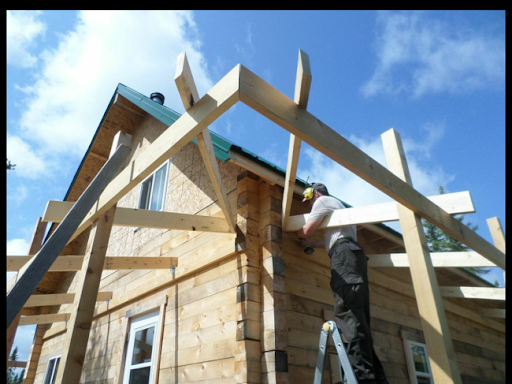 As I finished up the main construction of the sauna porch, I began to move over to the cabin porch. I followed very similar techniques and style, with a few significant differences due to the time frame of construction that took place on both buildings. This also coinceded with me hosting my friend and his two daughters for an extended visit. 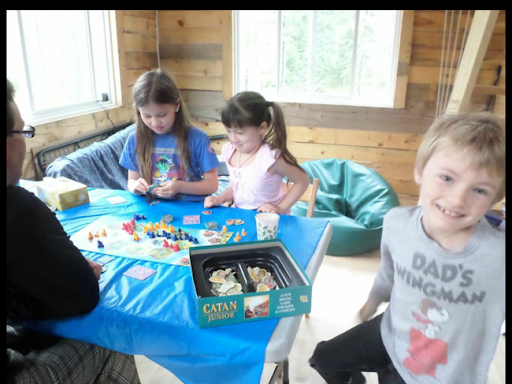 This is nice, as they are planning on moving out of the country this winter and we wanted to be sure that the kids could have a good chance to play together before they left for warmer climes. It was nice that we were able to share the Canadian Lakehead Exhibition with them! The past few weeks I have also been spending in southern Ontario with my family to help my brother celebrate his marriage to a beautiful and wonderful young lady. 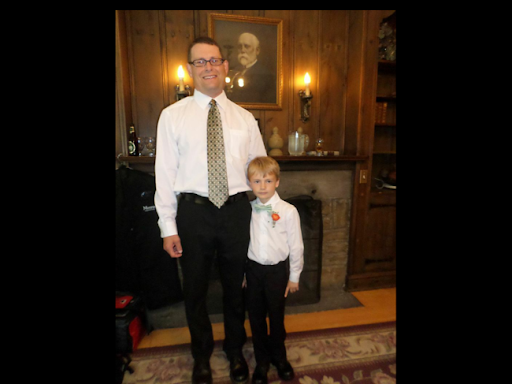 That was heaps of fun, and it was nice to see Kenny even come around and participate as their ring-bearer! We were so proud of him! On the other hand, this trip also plagued me with more homesickness than I expected. Maybe it was mostly for the foods I remember from Kitchener-Waterloo, or seeing how great a community it was and continues to become. I also was feeling extremely run-down (possibly a side effect of some of my latest medications), which didn't help me to feel enthused about the work I had left to accomplish at the homestead before winter truly sets in. Or, most likely of all, it was re-experiencing activities Kenny and I had done when he was little, and missing those times now that he is growing all too quickly into a young man. This past labour-day weekend also didn't help with its reminders of the end of summer and back to school type of narrative :(. In any case, things at the homestead do keep getting better month on month and year on year, so I shouldn't complain too much. 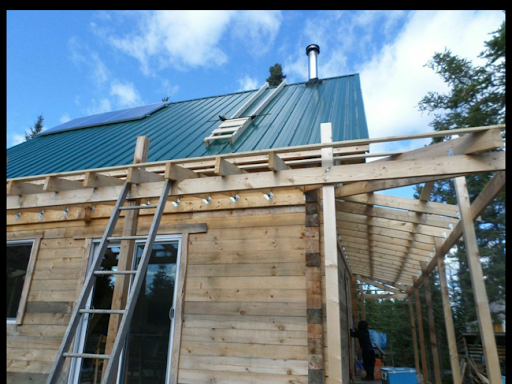 As for the porch on the cabin, I was able to make it about nine inches higher than on the sauna, which should help a bit with light and open-ness. 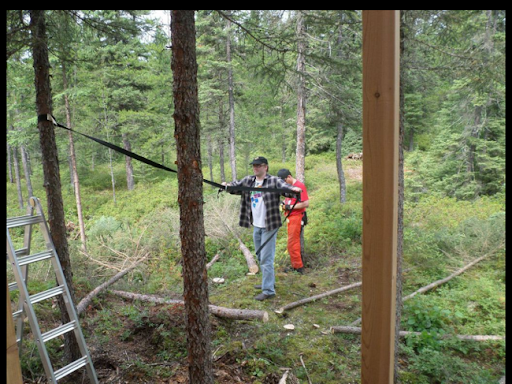 Also helping with opening things up was my work at clearing the trees around the cabin. Judicious use of straps helped to ensure no serious mishaps with trees falling against my handiwork. 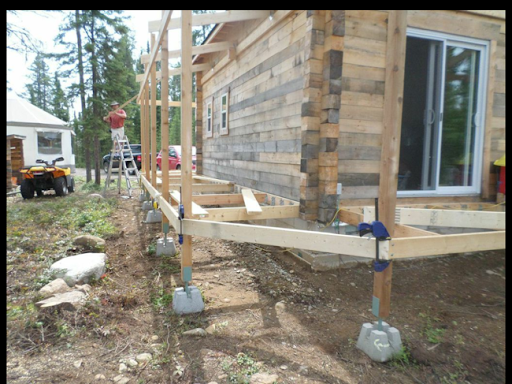 Before I left, I was able to get the rafters and most floor joists installed, so the next big job will be to strap the rafters and install the steel. 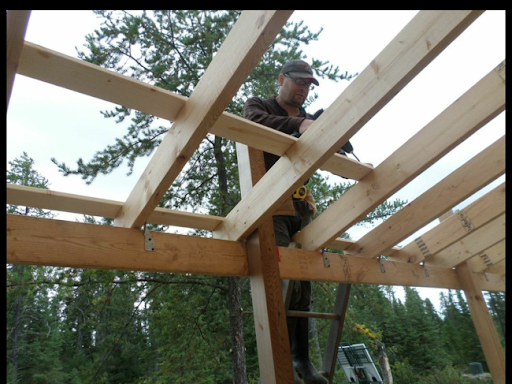 As with the sauna, the floor joists were on 12" centres so that I could feel more comfortable using true 1" rough cut boards for the decking. 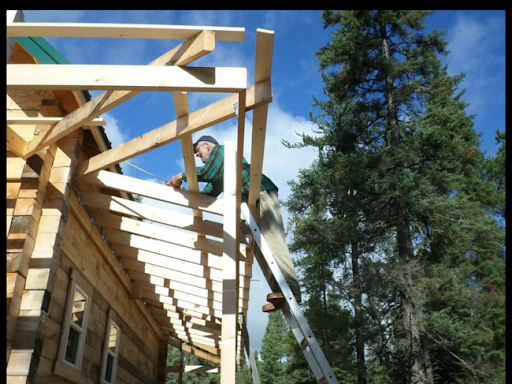 The rafters were on 18" centres, hopefully that will be sufficient for the snow load they are due to experience. There are a number of other jobs pending as well, hopefully my friend will have more free time to help out with those, and then perhaps my parents can visit us once before Christmas so that they can keep an eye on Kenny while Donna and I work on some of our other projects.